Hikashu will embark on a tour of Russia and Europe next month. Notably, this time the tour includes some western cities. For years, the band has been trying to reach western shore of europe. They are now an international act - regularly performing in Russia, East Europe, and North America. But the western continent is really hard to break into. Now it looks like they will succeed at last. Until this time, Hikashu has played in west europe only a handful of times - some German cities in early 1990s. So this tour is going to be very important to the band. If it succeeded, they would be back surely. If not, well, it takes another dozen years for next time, maybe. The reason why they tour Russia every year is because the audience is so enthusiastic about the band. The audience of the Canadian tour in 2013 was so great and the band still talks favorably about it. Although they're not succeeded yet to be do another Canadian tour, they would be very positive if there's a chance. The band has been really trying to perform outside Japan for years. So please - especially west europeans - show your support. Spread the word and attend the gigs. Such acts are of great help and encouragement to the band. Thank you and enjoy the show. Hikashu recently uploaded a video of "Twilight Affirmation, Morning Denial," a cut from the 2012 album URAGOE, on YouTube. This is recorded live at Sakuraza, Kofu on October 7, 2014. There are some gritches and dropouts but itself fine performance. This month Thomas Strønen's new group called Time is a Blind Guide will tour Japan for the first time. The tour is organized by Makigami Koichi. The group performs Strønen's compositions and has already recorded the first album, which will be available soon from ECM records of Germany. For some of the dates, Makigami will join as an opening act with his company, Sato Masaharu on percussion and Janmah Shimamura on electric guitar. 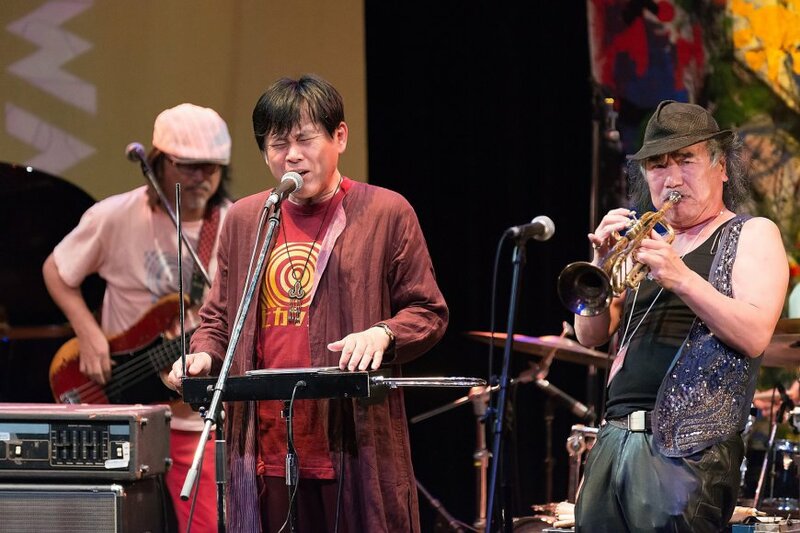 Hikashu and Oki Itaru at Jazz Art Sengawa 2014. They'll be together again in Vilnius in October. Aside the Jazz Art Sengawa appearance, there is only one Hikashu gig this month - La Mama of Shibuya on September 17 (which we cover later). But that doesn't mean there's not so much to talk about. On the contrary, we have a plenty to cover. Now read on. 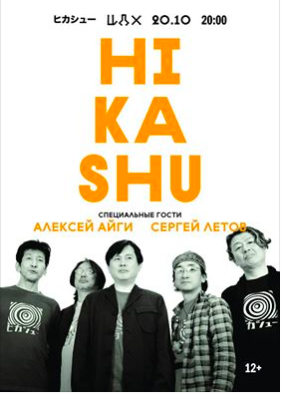 Hikashu will embark to tour of Russia and East Europe from mid to late October. This is a replacement of the lost Russian tour originally planned for this April. Unfortunately, we don't have a list of date for this tour yet. Right now, gigs at Sankt Peterburg, Arkhangel'sk and Vilnius have been announced so those dates are confirmed. Other than that, probably there's a Moscow gig. We'll let you know when the details are available. In mid 1980s, Hikashu composed and recorded (mostly) instrumental music for dance and ballet, and those music is known by the name "Dance Music Series." One of them are already reissued on CD (as "Watashi No Tanoshimi" [My Pleasure] in 2010) and the rest are going to be released on October. All the titles are reissued for the first time. There are three albums to be reissued this time. 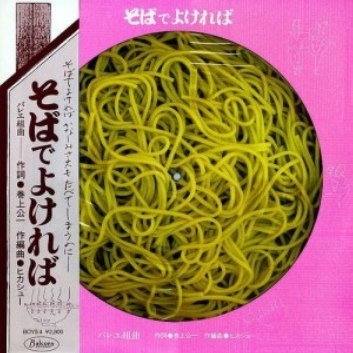 "Soba de Yokereba" [If Noodles were acceptable], "Nanimo Kamo Odore" [Everything Dance] and "Jisatsu Na Disco" [Suicidal Disco]. The first two has been released - the first on picture disc, and the second on cassette tape only. The third one remained unreleased in any form and will be available for the first time. Needless to say, the albums are remastered so the sound quality is quite pristine. Unfortunately, those titles are sold only at gigs and mail-order. So no retail. But oversea fans would be able to get the CDs via e-commerce house like HMV Japan. Picture Vinyl of "Soba de Yokereba"
Hikashu announced to hold two tribute concerts to Nomoto Kazuhiro in November and December this year. Nomoto was a reed player who joined the band in 1983, shortly after graduating university, and remained until 2002. Unfortunately, he passed away by esophageal cancer in 2003. He was 43. Besides being a strong musician, he also wrote many fine compositions for the band. 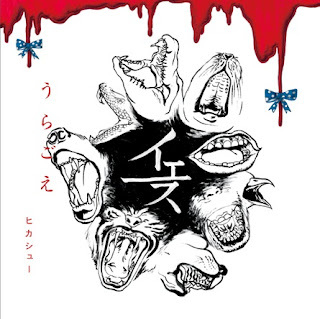 His work includes "Tengoku wo Nozokitai" [Glimpse the Heaven], "Zo Azarashi" [Elephant Seal], and "Acchi No Me Kocchi No Me" [Nervous Eyes]. 2015 is the 13th anniversary since his passing, and that year is special in Japanese tradition, so that's the reason why the event is hold. Actually, Hikashu did a memorial gig for him in 2003, so this is the second time. The difference between them is a line-up. This time the band invites other ex-members - Inoue Makoto (keyboard), Tsuno-Ken (drums), Yoshimori Makoto (keyboard), and Niida Kozo (drums). Except for Inoue (who has been a frequent collaborator with the band), all other musicians will be together for the first time since their leaving. 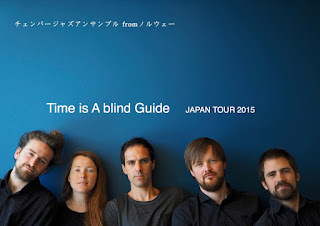 Precisely, there are two other members who played with Nomoto - Taniguchi Masaru (drums) and Torsten Rasch (sampler). Unfortunately, they are simply not available. Taniguchi passed away in 1989, while Rasch has been active as a composer in Europe and currently resides in Berlin. Anyway, this event is special one for the band, the musicians, and of course, us fans. The dates are November 30 at LaMama of Shibuya, and December 13 at Pit-Inn of Shinjuku. Also many guest musicians are planned to participate so stay tuned.